So, Barbagallo as a highly abrasive circuit, but relatively low speed, is tyre wear anywhere near that at the high speed but relatively normal abrasiveness of PI? My understanding (which may not necessarily be correct) is that tyre WEAR at Barbagallo would be greater than PI. Tyre FAILURE, as opposed to wear, was high at Phillip Island due to excessive stresses on the tyres internal construction. I haven't seen any references to tread wear on the PI tyres so have no idea what sort of conventional wear they had - the treads may still have been OK? What disappoints me is that I remember reading before Clipsal that Dunlop were recommending reducing the amount of negative camber, but if anything it seems the teams pushed the other way. Then the majority of fans seem to want Dunlop's head on the block? If your engine builder said we recommend you don't go over 7500rpm, but you say nah, we'll push it to 8000rpm, do you blame the engine builder if it goes pop? I imagine they can probably handle 9000rpm actually, NASCAR run that, just the cam profiles will not be optimised for such rpm at the moment. Racing is all about pushing the limit and ignoring manufacturer specifications, but I agree they all must now strictly adhere to camber and pressure requirements. Anyway, I am still looking to Dunlop for my road car tyres. They are the only ones who offer a 91Y spec that is 2kg lighter per tyre than the common 94W spec (have to import it from Europe though). They perform near the top of all the tyre tests, on par or better than the Michelins, Pirellis and Continentals, and best in the wet. I'm considering these, even though stung by sister tyre Goodyear before. Also, excellent in the tyre tests and indeed excellent when new (as tested by the tyre tests), but seems to have lost grip as it has worn and worn fairly quick for a road tyre. Power down tractions issues from the pilot, maybe? “We are allowing the tyre warming cupboards at the endurance rounds following a review of the circuits we are competing at and in consultation with Pirelli,” said category manager Ken Collier. “The latest GT3 cars are developing much more aerodynamic down force than in previous cars and this results in higher corner speeds and greater load on the tyre. “Also, there have been occurrences of tyre damage through low pressures and/or excessive camber set-up which is a problem in qualifying sessions. “Tyre warming is permitted in many GT races in Europe and it has been found to extend tyre life and assist in reducing the occurrence of set-up related damage to the tyres. Possibly but that'll depend on Dunlop's view after the investigation of the tyres sent to Japan I would imagine. Tyre warming systems have long been outlawed in V8's - primarily on grounds of cost containment and also the challenge of cold tyres from a sporting point of view. Need to bear in mind that F1 of course use tyre blankets and Pirelli has had the odd issue there too - remember the tyres disintegrating at Silverstone a few years ago? Phillip Island clearly presents something of a challenge for tyre manufacturers - hopefully for Pirelli lessons learned last time will help this time and the same goes for Dunlop - neither has done a bad job necessarily, it's simply development of the product to suit extreme conditions. Out of interest, is the only place this supposed Bathurst tyre test has been mentioned is from the keyboard/mouth of James Phelps? Pretty certain a Dunlop representative has spoken of the intention of testing and working with VASC to have it done at Bathurst or PI. Maybe it was on Inside Supercars? I cant recall. 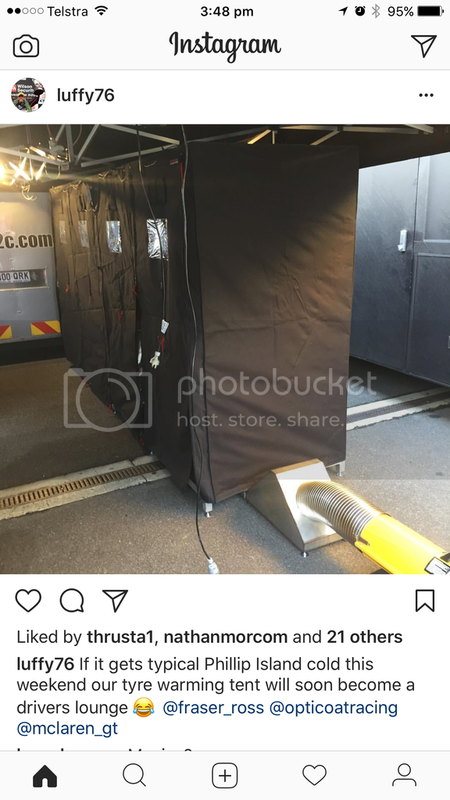 The tyre warming box doesn't look particularly complex or expensive to put into place..
Am I right in saying that the Bathurst tyre test day seems to have no legs whatsoever? Watching the Gt3 enduro race.. tyre issues with the pirelli. How many cars had tyre issues? And McConville gave the reason. Nothing to do with tyre or track. Well, to me it looked like some competitors experienced significant traction problems when the tyres made contact with wet surfaces. Ash Samadi in particular found the Pirelli's didn't offer much grip on either asphalt, grass or mud!